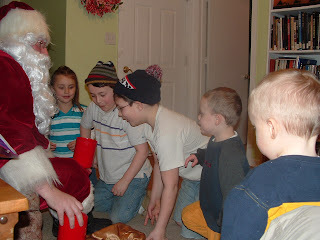 Santa came to see the kids tonight. He did a magic trick with lights and candy and stuff. The kids are still talking about that. About how Santa pulled a red light out of Jakes tummy. And he pulled one from behind Eme's back. So funny. Doesn't take much to impress little kids, eh?